Method #1 - Insert the paper under the pattern so that one edge is on the fold line, and another edge is right at the point of the shoulder seam, as you see in the above photo. This is one of two ways that I use. Draw an outline tapering down from the shoulder. Two necklines are shown. One follows the v-neck but adds a few inches and then gradually joins the line to the shoulder. Another line, above that, alters the v-neck into a round neck. You can get special rulers and tools to make new necklines, but this is how to do it quickly, freehand. Cut around the paper on the lines you drew, and and across the top of the pattern on the shoulder, then down around the armhole. Now you can cut your fabric, following this new pattern section you have underneath the pattern. If you plan on using it the same way again and again, just tape it to the original pattern. I cut along the freehand drawing of the rounded neck, as you see in the photo. You do have to be careful to draw it very straight at the fold line, or you might end up with a slight dip or slight raised area that you do not want. If this happens, just open up the fabric after you have cut it, and trim it evenly. Remember to leave the shoulder seam the same. You will not be raising it at all. I use my knives instead of pins to anchor down the tissue pattern, as they are easier to remove and move around on a pattern.Insert your piece of paper and trace around the edge of the neckline exactly, with a pencil. Pull the paper up a few inches so that the drawn outline can be seen, and then angle it (the paper) to the edge of the shoulder, as you see. You can raise it as much as you like, depending on how high you want it. The paper will stick out beyond the fold line, but you'll be folding it back or cutting off the excess so that it is even. Make sure not to move your pattern, when using this method. Just move the paper. This﻿ is the way people used to do it before all the curved rulers were available. You might want to try this on an old piece of fabric to practice on, first. After cutting the new neckline, open up the fabric and lay the shoulders of the fabric on your own shoulders to see how the neckline turned out. If necessary, trim and straighten out the neckline with scissors. To make a facing: This will come in handy when you have a pattern that is missing the facing piece, as well as when you have to draw a new facing for a raised neckline. On a piece of child's construction paper or printer paper, lay your garment piece with the neckline down and draw right up against the cut area of the neckline, down the folded edge, and across the shoulder. I've moved the fabric slightly so that you can see what the drawing should look like. This is what it looks like at this point. The straight edges should be about two and a half inches across. Following the inside curved line, draw an outer line and joing the shoulder and fold line, as you see, above. You can always trim it with your sewing scissors if the wider curve is too wide or too straight for the garment. This is the kind of thing that takes a little trial and error, but it works well for most people. Do you also have to adjust the facing - make it shorter or what? Thank you for posting this helpful tip! I am very sorry I didnt mention that: I dont use facings because I cut a white muslin lining exactly the same. If you use a facing you will have to cut a new one. Just trace around your new neckline and make a new facing, using the neckline as the top of the facing. Perhaps I can show it on this post later. Your back neck facing will remain the same, so you just join it to the new facing. Lay your dress down on fabric and cut around it to make a new facing, or use the pattern. I will try to take pictures of that later. You need a new facing only if you have altered the shape of the neck. You can use your old facing but you should measure it up together to see if they match. I will try to add pictures of how to make a new facing, tomorrow. If your raised neckline is exactly the same shape as the original pattern, you should be able to use your original facing, although you may have to clip off the ends of it to match up with the shoulders. The raised neckline makes the facing shorter on v-necks. 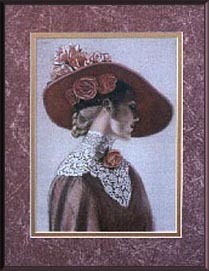 I will have to dig out my alterations book that I made in high school years ago. I for got about it. My little girls grow tall so fast ... we cut appart the old worn out jumper and use it as a pattern and just add length. Great idea! I also use table knives instead of pins...sometimes after a big shopping trip to Aldi's I used tomato paste cans. I have been sewing for years, but keep to the patterns! :) This has given me the confidence to make the patterns work for me! I use bowls, books, or cans of veggies to cut out patterns. But since most of my stuff is much larger than a garment pattern, it works well for me. I've used knives too but like cans better. So, Lydia, do you line the whole dress with muslin or just the bodice? If you line the whole dress, does it feel too bulky when you add a half slip, or isn't one needed? I like this idea, because it seems it would make a tidier appearance around the neck, be quicker, and allow me to use lighter fabrics that I sometimes reject for summer wear. Thank you for posting these instructions. I have been drawing them freestyle but didn't think of the paper behind the pattern. This is so much easier. For a facing I often use single fold bias tape and skip the facing. Oh, thank you so much for showing this. I'm only a beginner at sewing but stopped because I couldn't find good patterns with a decent neckline. Thank you for all your articles. I love to go back through all of them because they're such jewels. Thank you Lydia for showing this tutorial. I know very little about altering clothes. When I sew clothing for myself its always from patterns. Sometimes the patterns need a little something or you find a great blouse in the thrift store and it needs a little something and I can't figure out how to do that. This helps a little. I would like to know of a good alterations book to buy where I could learn this skill. Thank you again, Janet Westrup. I may post pictures of making a lining, later, but until then: I cut only the bodice of lining on a dress, and attatch it like a facing, tacking it down on the seams at the lower edge and the shoulders. A lining is simply a repeat of the pattern, sewn on the inside of the garment to give it a more finished look. It also makes the garment really comfortable. After sewing the shoulders and side seams of a lining, before attaching it at the neckline like a facing, you have to press and stitch the lower edge one-fourth inch. The armholes will be stitched in with the sleeves, or you can also press them under one-fourth inch and hand stitch them to the finished sleeve seam. It will be easier to understand when I get step by step pictures. I usually wear a half-slip with these dresses, which is also easy to make, if you do not have one. You can use a dress pattern to make one, by finding the waistline of the dress and cutting a skirt, ironing down a casing and inserting elastic. You can use white muslin, which seems to work just fine with most skirts and dresses. Thank you so much for your Titus 2 ministry through this blog...This idea will help ladies sew modest dresses, whether the pattern people want ladies dressing modestly or not! Thank you so much for sharing these wonderful instructions. This is a perpetual problem with my own sewing--I find lovely blouse patterns but the neckline is just too low. How do you lower a neckline? To lower a neckline, just trace as I have shown, and then lower the paper on the pattern, instead of raising it. I will try also to show how you can make your own collars, using a method similar to this. I haven't seen collars in commercial clothing in a long time. As I am still receiving questions about how to lower a neckline, I am planning to make a post about it in the future, hopefully this year. If you do not want to cut your tissue pattern to lower the neckline, it might be a little harder, but I would suggest you draw the neckline with a pen right on your pattern and just cut around it. Then make a facing to match.